Do you remember your 8th grade year? Do you remember desiring to stand out or trying to do everything you can to fit in? For me it was trying to get that Farrah Fawcett hair to fit in. Yes, I certainly dated myself with that reference. I never came close to that look back then and then laughed at myself when I accomplished it in my 40s. 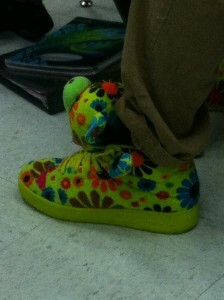 These are chartreuse hi-tops with psychedelic flowers and a teddy bear head attached to the strap that comes across the front. Do you see the teddy bear head? I have never seen such a thing. On my days off I am a substitute teacher at a middle school I love. I’ve been doing this since 1991. (Last day of school is tomorrow!!!!! I rejoice like every other teacher!!!!!) An 8th grade boy at my school has worn these throughout the year. Not because his mother made him. Not because they are hand-me-downs from his sister. These are his choice. His look of choice. Which he wears confidently–as an 8th grader. That is bravery which comes from not being afraid to be vulnerable. This boy truly believes he is worthy of love and belonging. I pray he never loses this. I pray that life doesn’t squash this out of him. He is beautiful. The shoes…maybe not so much.